Dulé Hill and Fantasia Barrino head the cast of the don't-let-it-end, entertainment-packed musical revue After Midnight playing Broadway in a production based on last season's sold-out NY City Center Encores! and Jazz at Lincoln Center presentation of Cotton Club Parade with musical direction by Wynton Marsalis. This foot-stomping, hand-clapping good time with excellent choreography by Director Warren Carlyle is pure entertainment. The 90 minutes without intermission comes to a fabulously staged curtain call way to soon. I wanted more and gladly would have sat through another hour and half. And that's not something I say about many shows. Hill, known to many for his TV work on "The West Wing" and "Psych," doesn't have a Broadway belt voice, but holds his own and charms us in the role of a sort of MC/narrator in the presentation as conceived by Jack Viertel. It doesn't take the route of most jukebox musical by trying to put an unlikely story around a bunch of songs. Instead, Hill occasionally gives us times and places and uses the words of poet Langston Hughes to create the mood. The show's thrust is its singing and dancing. Popular singing star Fantasia is one of several guest artists planned for the s how's run. She will be followed by Grammy Award-winners k.d. lang (2/11/14 – 3/9/14) and Toni Braxton & Kenny “Babyface” Edmonds (3/18/14 – 3/30/14). Future “Special Guest Stars” will be announced soon. The show isn't dependent on star power for its locomotion. 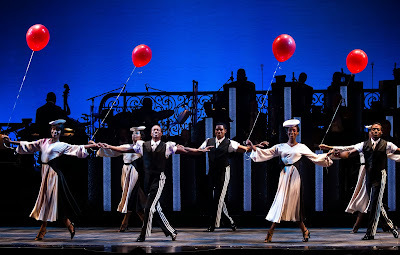 A cast of 25 excellent vocalists and dancers: Tony Award-winner Adriane Lenox reprising her critically acclaimed role as the blues singer with a sense of humor; Julius “iGlide” Chisolm from the renowned dance crew RemoteKontrol, reimagining Harlem’s popular 1920’s “snakehips” dance; hip hop star Virgil J. Gadson; Tony Award-nominated modern dancer Karine Plantadit; Michael Jackson’s tap coach Dormeshia Sumbry-Edwards and tap-dancing choreographer Jared Grimes in stunning tap routines. The cast also includes a male quartet comprised of Grammy Award-nominee and member of Bruce Springsteen’s E Street Band Everett Bradley, Cedric Neal, T. Oliver Reid and Monroe Kent III; a female trio of Broadway vets including Carmen Ruby Floyd, Rosena M. Hill Jackson and Bryonha Marie Parham; and accomplished dancers Marija Abney, Phillip Attmore, Christopher Broughton, Taeler Elyse Cyrus, C.K. Edwards, Danielle Herbert, Bahiyah Hibah, David Jennings, Erin N. Moore, Justin Prescott, Tony Award nominee Desmond Richardson, Allysa Shorte, Monique Smith and Daniel J. Watts. Bruce Harris, Alphonso Horne and James Zollar on trumpets; Wayne Goodman, Art Baron and James Burton III on trombones; Adam Birnbaum on piano; James Chirillo on guitar Jennifer Vincent on bass and Alvester Garnett on drums. Musical supervision and additional arrangements are by Daryl Waters. This ensemble triggers something I never remember seeing before: at the end of the curtain call, the audience sits down to hear the postlude -- no dashing up the aisle before the house lights come on for a quick exit for this musical. The show's creative elements wow the crowd also. The ballroom at the cotton club is designed by Jean Lee Beatty with precision lighting by Howell Binkley. Isobel Toledo, the fashion designer who created First Lady Michelle Obama's first inaugural gown, designs the flashy, swirling deco costumes. It's all really, really good -- and one of the most enjoyable shows I have seen in a long time. A personal highlight for me was the precision "penguin" routine. I could have watched a whole show of just that. Tap on over to the Brooks Atkinson Theatre, 256 West 47th St., NYC After Midnight. http://www.aftermidnightbroadway.com/. I admire the valuable information you offer in your articles. I will bookmark your blog and I am quite sure they will learn lots of new stuff here than anybody else!